Wait. Before you click the link and see which they are, try to guess. Jot your guesses down in descending order from most number of speakers to least. See how close you get. As for me, I was surprised by one of them in particular. And the earth was of one tongue, and of the same speech. And when they removed from the east, they found a plain in the land of Sennaar, and dwelt in it. And each one said to his neighbour: Come let us make brick, and bake them with fire. And they had brick instead of stones, and slime instead of mortar: And they said: Come, let us make a city and a tower, the top whereof may reach to heaven; and let us make our name famous before we be scattered abroad into all lands. And the Lord came down to see the city and the tower, which the children of Adam were building. And he said: Behold, it is one people, and all have one tongue: and they have begun to do this, neither will they leave off from their designs, till they accomplish them in deed. Come, therefore, let us go down, and there confound their tongue, that they may not understand one another's speech. And so the Lord scattered them from that place into all lands, and they ceased to build the city. 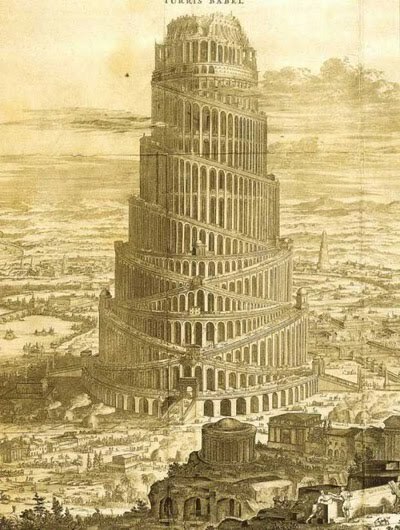 And therefore the name thereof was called Babel, because there the language of the whole earth was confounded: and from thence the Lord scattered them abroad upon the face of all countries. Patrick - which one surprised you? As an amateur linguist, I'd like to know, just out of curiosity, which of the top nine languages you found surprising. I have an idea which one it might be, and I assume it surprises many people. Just wondering if I'm right. I wasn't expecting Bengali. I just assumed it would have been dwarfed by Hindi. I got 8 of the 9, with the first 4 in the correct order! Bengali got me also. I didn't guess Bengali either, and I also didn't think French would be so far down the list, but then again they were ranking by the number of "native" speakers. Mandarin Chinese is definitely overstated though. Most Chinese are bilingual; they speak their own local language and they speak Mandarin which they learn in school and which dominates all forms of Chinese media. Mandarin is only the first language for a fraction of the Chinese population, about 15% or so. I was expecting Indonesian to be in the list and was surprised to learn that it is distinct from (and less widely spoken as a first language than) Javanese.